Check out these fun asteroid facts for kids. Enjoy a range of interesting facts about the Solar System’s asteroid belt, the impact of potential asteroid collisions with Earth, theories that suggest an asteroid led to the extinction of the dinosaurs and much more. Asteroids are small Solar System bodies that orbit the Sun. Made of rock and metal, they can also contain organic compounds (some scientists suggest that asteroids could have brought they necessary chemicals to start life on Earth). 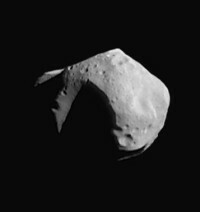 Asteroids are similar to comets but do not have a visible coma (fuzzy outline and tail) like comets do. Asteroids are also known as planetoids or minor planets. Asteroids vary greatly in size, some feature diameters as small as ten metres while others stretch out over hundreds of kilometres. Note that objects under ten metres in diameter are generally regarded as meteoroids. The first asteroid was discovered in 1801 by Italian astronomer Giuseppe Piazzi. Named Ceres, it features a diameter of around 950 kilometres and is now regarded as a dwarf planet. Ceres was given dwarf planet status in 2006, along with Pluto, Eris, Makemake and Haumea. The asteroid belt lies roughly between the orbits of Mars and Jupiter in the Solar System. It is home to a large amount of irregular shaped asteroids that range in size from dust through to the dwarf planet Ceres. The technology used for discovering asteroids has improved dramatically since original discoveries and astronomers now have access to a range of powerful telescopes to aid in their research and discoveries. It is believed by many scientists and researchers that an asteroid impact was the cause behind the extinction of the dinosaurs around 65 million years ago. The possibility of an asteroid colliding with Earth has received increased attention over recent years. The Shoemaker-Levy comet that collided with Jupiter in 1994 were given widespread media coverage and Hollywood also played its part with moves such as Deep Impact (1998) and Armageddon (1998). While these movies sometimes featured dubious science they certainly increased public awareness of the topic. There are now many groups and organizations that use automated systems to discover near Earth asteroids. While many are discovered, they rarely have the potential to cross paths with Earth. There have been many ideas suggested as ways to avoid the unlikely but potentially devastating impact of an asteroid collision with Earth, these include using nuclear explosions to break the asteroid into smaller pieces or other weapons to deflect it off course.